“These dark lines,” says Ace, our guide, pointing to veins that streak through the ice like chocolate wafers in a slice of Viennetta, “are volcanic ash.” Maisie, our eldest daughter, runs a mitt along the length of a dirty-grey layer just below the cave’s ceiling. From the colour of the surrounding ice, its depth and the way it has compacted, we are told that this one marks the fallout from Eyjafjallajökull, the volcano that erupted in 2010 and famously scattered its gritty debris across Northern Europe. It’s a fascinating insight into how a glacier is formed. And it’s made all more pertinent by the fact that we are 40m underground, inside the second largest one in Europe. This is Langjökull, the Long Glacier, 125km northeast of Reykjavík. We had rumbled our way up here from nearby Húsafell in an enormous monster truck, the exciting first leg on a unique tour with Into the Glacier. The twenty-tonne beast had been a NATO missile launcher in a previous life and looks remarkably like something Darth Vader and co. would have used in The Empire Strikes Back. On a clear day, the views from the top of Langjökull are superb. But this is not a clear day, and we all wait quietly on board as a snowstorm howls around the truck and the guides set to work clearing the entrance, their fuzzy forms almost lost in a smog of white. Our kids find the dash from the truck to the tunnel surprisingly hilarious, laughing as the wind whips off their hoods and the snow dances around their faces. And then we are inside, the noise of the blizzard gone in an instant, and making our way down the start of the largest man-made ice tunnel in the world. We stop to strap crampons to the soles of our shoes – to gain traction on the slippery floor – and then we’re off again, heading deeper into the ice. 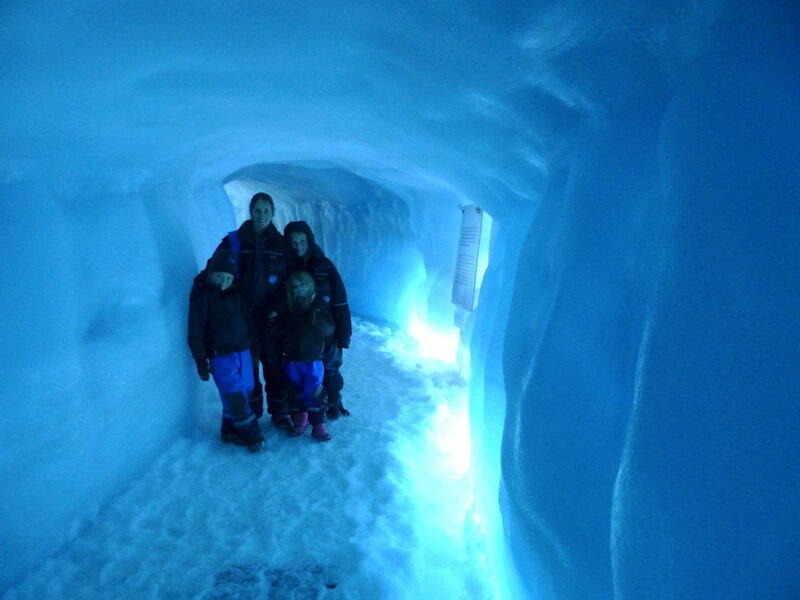 From within, the glacier takes on a dreamlike quality, its shiny smooth walls bathed in blue from soft LED lighting. 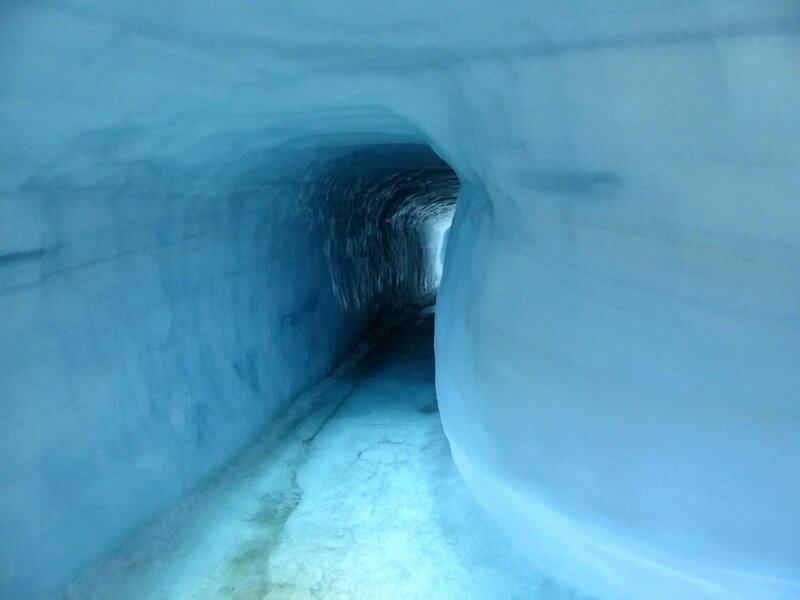 We pass through several chambers, the ice changing colour with age the further we go, and then onto a wooden bridge that leads into a gaping crevasse. Standing at the heart of this yawning fissure – normally so dangerous but here, surrounded by icicles that hang like jagged chandeliers, so innocuously beautiful – it’s strange to think that the glacier itself is receding year on year and that some day soon all of this will be gone. THE MONSTER TRUCK. AND MAISIE AND JOE, BRAVING A BLIZZARD! Langjökull is 125km northeast of Reykjavík. Trips into the glacier depart from Hotel Húsafell, a stylish lodge near the foot of the ice cap.